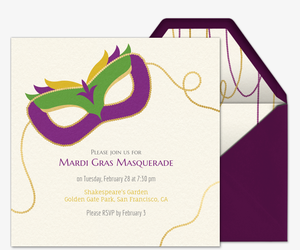 Eat, drink, and be indulgent this Mardi Gras with free and Premium online invitations from Evite. 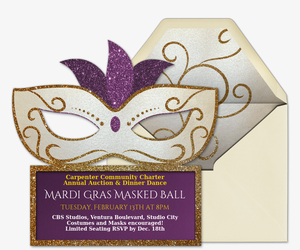 Our dozens of digital designs can help you round up your friends and kick off the festivities, whether you are celebrating the Carnival by visiting New Orleans, hitting the streets for a parade, or meeting at a bar. 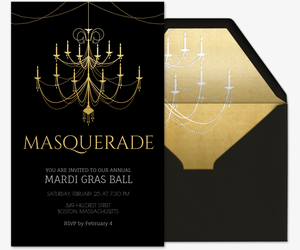 Online invitations are easy to make your own: Personalize one of Evite’s Upload Your Own or Design Your Own invitation templates with a favorite photo or your own design. 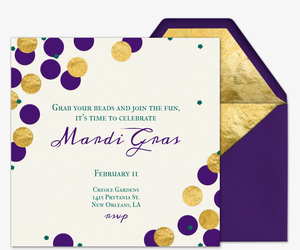 Or, choose a ready-to-go, Mardi Gras-themed invitation and personalize it with a custom host message. No matter how casual or extravagant your Shrove Tuesday shindig will be, paperless invitations keep all the details and tools you need in one place. Track RSVPs, manage your guest list, post comments and photos, send messages, and make event updates at any time -- even on the go via Evite’s mobile app. You and your guests can return to your invitation anytime to relive the memories. 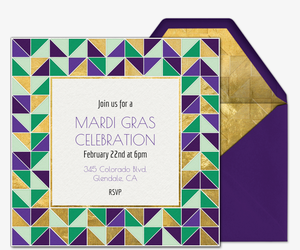 Go big or go home before Lent begins by choosing an Evite Premium invitation. Evite Premium is an advertisement-free experience, complete with invitation envelopes, custom digital stamps, and the option to include extra photo and text cards. Pricing is determined by the number of guests you choose to invite. Let the confetti fly on Fat Tuesday with festive party ideas from Evite Party Ideas, at ideas.evite.com. Whether you’re planning a masquerade party, a kid-friendly event, or an indulgent dinner with rich and fatty foods, get your DIYs, tablescape inspiration, menu ideas, and even etiquette guidelines from our party pros. Still searching for the fitting invitation? 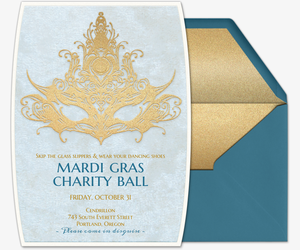 Browse more design choices in our theme party, happy hour, cocktail party, girls’ night, or dinner party invitation collections. Celebrating a different occasion? Evite also has invitations for your birthdays, baby showers, weddings, and more.